Business and competition agency representatives are set to come together in Singapore, on 26 April, for ICC’s high-level roundtable on competition policy. Now in its eighth edition, the annual roundtable has established a reputation as a major-league gathering for business and agency antitrust experts to engage and to keep pace with developments in the international competition landscape. We take a look at 5 reasons not to miss this significant event on the competition policy calendar. 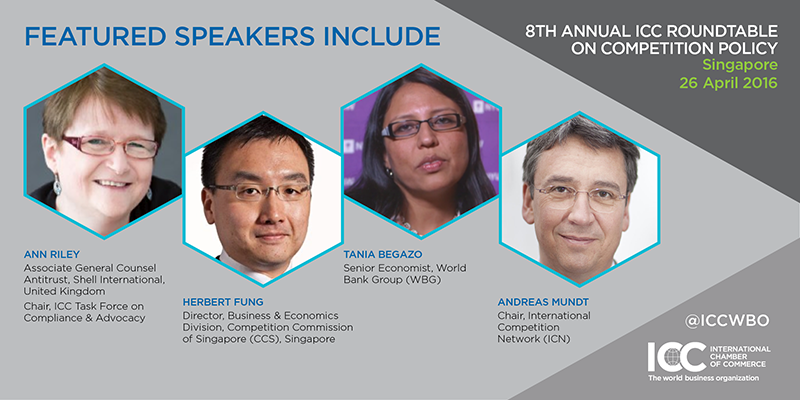 Organized in collaboration with the World Bank Group and taking place in conjunction with the International Competition Network (ICN) annual conference, the roundtable is an exceptional chance to engage directly with the experts. The high-level forum will also feature a keynote speech by Andreas Mundt, Chair of the ICN, the only international body devoted exclusively to competition law enforcement with a membership comprising national and multinational competition authorities from around the world. The roundtable showcases business-led initiatives aimed at enhancing competition law enforcement and is a valuable opportunity for constructive discussion not only on the pertinent issues shaping today’s competition system but the impact they are having on business practices. The Roundtable will specifically examine antitrust compliance and enforcement in South-East Asian and delve into the issues that could have implications not only on the work of ICN but on competition law and policies worldwide. On behalf of over 6 million members in 130 countries, ICC encourages a level playing field for companies to compete globally with the same rules. The roundtable offers business representatives an opportunity to contribute to open discussions with competition agencies from around the world on the competition issues that affect them most. Learn about ICC’s new proposal for creating a one-stop-shop for leniency markers that would offer companies an efficient system for reporting cartel behaviour while preserving incentives to enter into leniency programmes in multiple jurisdictions. The roundtable will also unveil ICC’s Leniency Manual which aims to demystify the leniency application process and provide guidance to businesses for filing local or multi-jurisdictional applications. Held on the eve of the International Competition Network (ICN) annual conference and immediately following on from a conference jointly presented by the International Bar Association Antitrust Committee and the World Bank Group, the roundtable is a rare occasion for networking with competition peers from the Asia Pacific region. So, whether you are a private practice lawyer, in-house counsel, an enforcement official or academic involved in antitrust law, don’t delay, register today! ICC thanks Baker Botts and K&L Gates for their support.